Last wednesday, more than 2,000 people attended the opening night of Odysseo under the White Big Top raised at the entrance of the Jacques Cartier Bridge for the last visit of the show in Montreal. Spectators of all ages were mesmerised by the elegance and virtuosity of the 70 horses and 50 artists whom they rewarded with heartfelt applause as well as a standing ovation to cap off the magical night. At the beginning of the evening, the Odysseo red carpet was a happening, drawing an impressive number of Quebec celebrities, such as Marc Labrèche, Guylaine Tremblay, Jean-René Dufort, Fred Pellerin, Maude Guérin, Mitsou and Pierre-Karl Péladeau. As part of the Rendez-Vous VIP experience, some 600 guests were treated to a buffet prepared by the tour chef, José Luis Acevedo; a reception, during which the guests had the opportunity to meet the team and the artists; as well as a tour of the stables, where they were able to get to know the majestic four-legged stars of Odysseo. 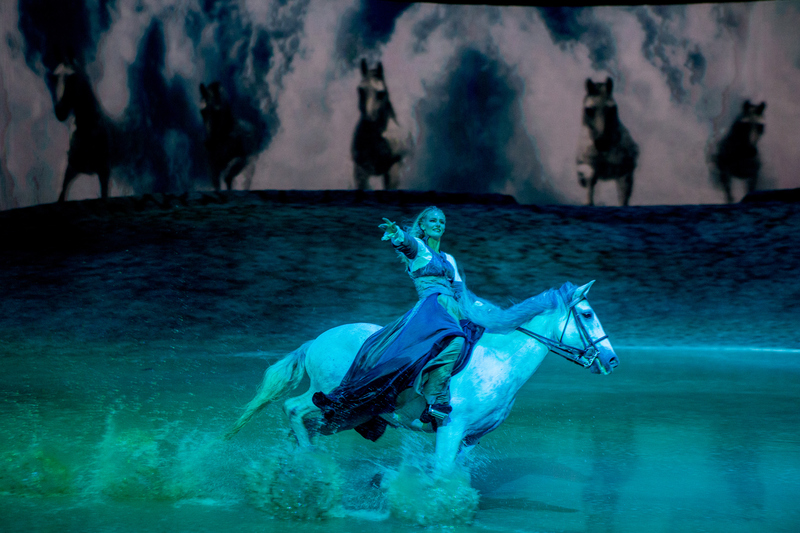 For the first time in Montreal, twelve Arabian horses shared the stage in the breathtaking “freedom number,” during which the artist Sylvia Zerbini uses only her voice and body movement to orchestrate an elegant and touching choreography that highlights the power and lyrical beauty of Odysseo. The enthusiasm created by this last visit to Montreal has led to the addition of yet another week in the Odysseo show calendar!